If you having problem staying logged in, Rest your cookie under MY STUFF setting or delete the board.moparts.org cookie in your browser settings. Also this problem seems to be only with latest ver of Internet Explorer. Some have found if they do NOT click the box to "Keep me logged in." they will say logged in with IE until they close the browser window. This problem is only with some change that Internet Explorer made in the some versions, I have tried to duplicate this problem, can not using IE 11 . But any other browser works fine. Like Firefox, Opera, Chrome, Ipad, Android and Safari !! 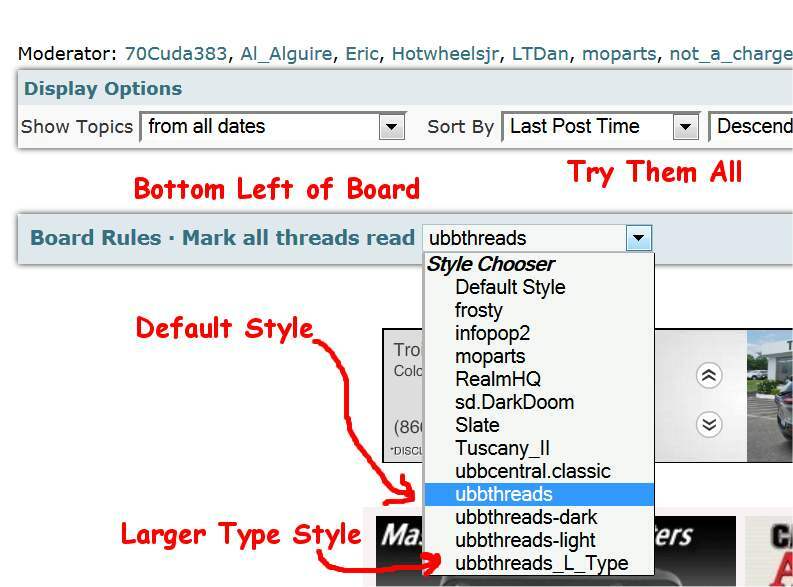 If you want a different color or fonts on the board try the choices , drop down box bottom left of board. To add pictures to a post, you can now ad 2 per post, the limit in the parts ads. They need to be smaller than 2megs in size. Click on File Manager, Load from you hard drive, Will show in your post. On this Software it is super easy to change the look of the board. This software in default settings has a three box set up , side box on each side and then the main forum in the middle. Some of the missing things, Total Posts, On Line etc, Should be in one of the side boxes. But I thought that squeezed the form middle too much. So for now I have it set with no side boxes. The old software started to have problems with the server, size of data base is the theory why, So I was forced to either upgrade to this software or START new with another brand. So I did this upgrade, The company that did the upgrade is working on the newer ver of this software. So he knows it inside and out. The old pictures loading got him, he ran a bunch of code to see why, No fixing, the data is missing for the auto load info. Then again it took him 12 hours to convert the data base over to the new software and He said this is one of the biggest board he has seem that he has upgraded. Lot of new setting to play with and user were saved, So no starting again. Resetting your cookie under My Stuff settings fixes that for most. But it seems that IE8 has a problem with the year long cookie expire that I had the board set at. So for that I had to rest the cookie expire to one week, so everyone one will need to log in every week. Thanks IE8 for that. Have tried to duplicate this problem, but my system works fine even using IE11 with no problems. Can't fix what does not seem to be broke on my end. But then again I never use IE so when I opened the board I had a fresh new cookie for the board and no problems. I think all this problem is the cookie not updating, Some have deleted the board.moparts.org cookie and restarted there computer so that IE is really using a fresh cookie. A pain yes, but when this software was written it did work with ALL browsers, IE made changes in some versions? that have problems.